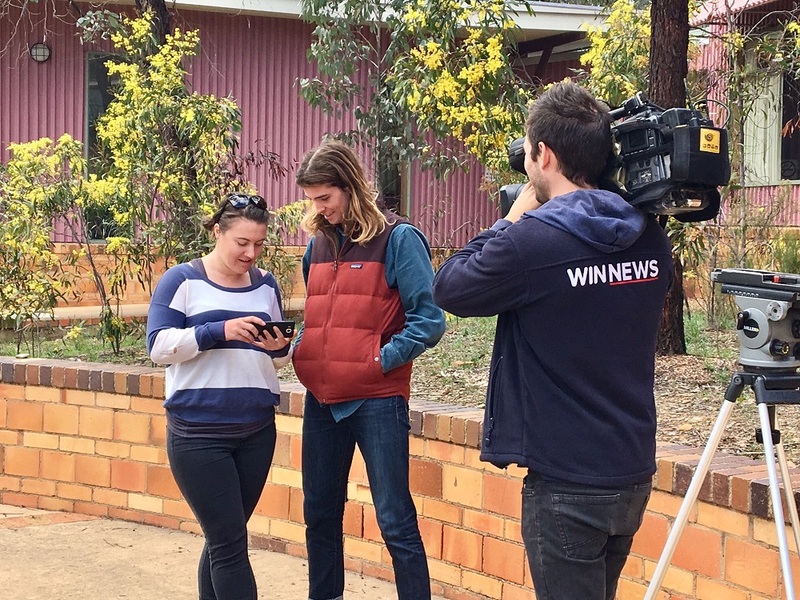 Outdoor Education students Kirra Coventry and Mat Wright share their remarkable koala rescue with WIN TV. They were paddling on the Murray River one day, world famous the next. We caught up with the co-stars of the koala video-gone-viral to see how they were coping with all the attention. If you haven’t seen the footage of our outdoor education students helping a koala stranded in high water, where have you been? The clip, filmed on student Kirra Coventry’s phone on Sunday, has been shared across the country and on major news stations in New York, London, Italy, China and more. In America they described the Murray as a raging torrent, in Japan they referred to the canoe as an ark. “The story’s taken on biblical proportions,” laughs lecturer Chris Townsend. For the past few days, Kirra’s phone, email and Facebook page has been running hot, with people keen for an angle on the moment she filmed fellow student Mat Wright pushing a canoe to the koala’s aid. “I came back from an awesome paddling experience, pumped out an essay and made the news in Italy and New York,” she says. “I’ve been contacted by so many people around the world asking to share the video. It’s been on MTV.” Closer to home it’s been featured on The Project, Australian Geographic and even the Goondiwindi Argus. Kirra says initially, she only intended to share the video with others on the paddling trip. “We had a chat group going for everyone on the trip and initially I was just going to post the video there but the file was too big and I was too lazy to change it, so I posted it on my Facebook page instead. Mat says while the experience of seeing his good deed go viral has been fun, it’s the rescue itself that will stay with him. He says he hopes the video will inspire others to likewise show kindness to animals, particularly our vulnerable koalas. Mat and Kirra’s lecturer Chris says that hasn’t always been the case on Ulupna Island, where the video was filmed. “Significant populations of koalas were relocated to off shore and inland islands in the 1980s as a conservation measure, including Ulupna Island,” he says. He says the Victorian Environmental Assessment Council recommended Ulupna become a National Park, but there was significant opposition from various quarters. In stark contrast, Chris says it warms the heart to know this footage of a simple act of kindness from his students has resonated with millions of people.